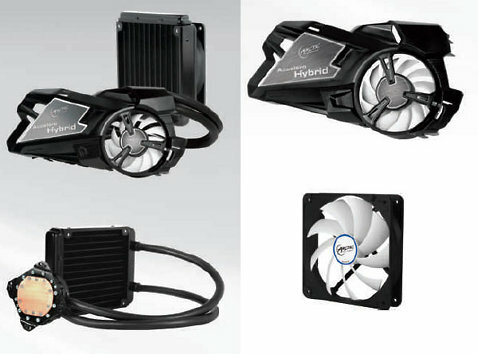 Earlier we had revealed of Arctic, a well known manufacturer of air and water cooling products had come up with a hybrid cooling solution that consisted of both a liquid and air cooling solution. 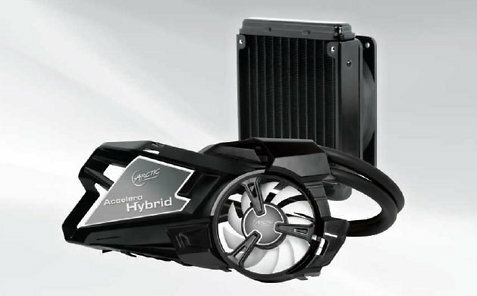 And today, Arctic have officially launched their hybrid cooling solution for graphics cards better known as the Accelero Hybrid. This kind of cooling solution, as described by Arctic being an all in one cooling solution gives out 200% cooling performance and runs 9 times more quieter than the stock cooler (referring to the GTX 680). The product comes complete with blocks, fans, tubing and a radiator. The water cooling setup takes care of the graphics processor while the fan cools down other heat generating components such as the VRM and memory chips. The cooler is compatible with a large range of AMD and Nvidia graphics cards with availability slated for 29th May. Prices have yet to be unveiled.